The year is 1880... Work begins on the Panama Canal in Central America. Thomas Edison patents his lightbulb. Dostoyevsky publishes his Brothers Karamazov. Sign language is (oddly enough) banned in schools for deaf children. But, it is also the year Gerardus Franciscus van Reeth and Joanna Julia Verelst stare lovingly into each other’s eyes, tying the knot a little later in the then tiny village of Niel to the south of Antwerp in Belgium. Gerardus and Joanna no doubt have seen the spark of entrepreneurship in each other’s gaze and a few years later begin a completely new chapter in the story of their lives. 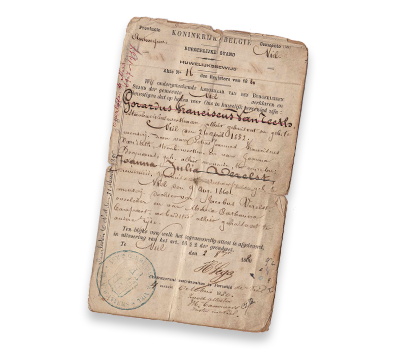 On 8 November 1888, Gerardus and Joanna start a business selling food products imported from the colonies, named the Groote Nielsche Koffiebranderij or the Great Niel Coffee Roasting Company. Succes Koffie is born. Gerardus and Joanna took a big risk, but it’s paid off. As their company grows and thrives, especially the coffee seems to be well-loved among the drinking populace. So their sons join the business under its new name the Groote Nielsche Electrieke Koffiebranderij or the Great Niel Electric Coffee Roasting Company. The couple’s son Hubert takes over the business after WWI, growing it further and continuing to sell grocery products and grains to local shops and private customers. 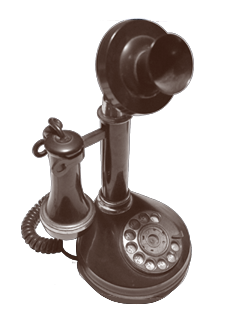 A rare luxury at the time, the company acquires its first telephone in 1919 and is allocated the round telephone number Boom 50. Boom being the local town around 5 km away... Well, the number has stayed the same up until today, with the addition of a few other numbers in front of it. Indeed, Succes Koffie loves tradition! Business keeps booming... Especially the coffee beans and blends with their enchanting flavours from the far east and other exotic places are well loved, so Hubert decides to grow the coffee side of the family business further. 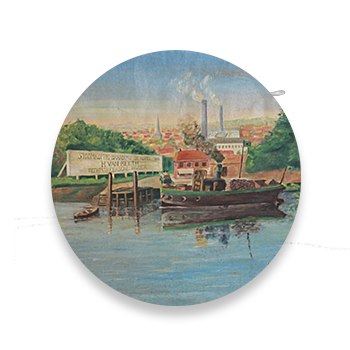 "Stoomkoffiebranderij De Rupel", or "Steam Coffee Roasting Company the Rupel" after the local river, duly sees the light in 1921, specialising in ‘the production and trade in raw and roasted coffees’. The start of WWII brings a time of shortage and rationing to the country. As international trade routes get increasingly more disrupted, importers find it more and more difficult to convey their goods from the colonies to Europe. Not only that, the Belgian ministry (under the auspices of the Germans) decides who is permitted to distribute coffee at all! But thankfully Coffee Roasting Company the Rupel has by now become one of Belgium's larger coffee suppliers and obtains a government licence to sell coffee and coffee substitute in the region to the south of Antwerp. Coffee Roasting Company the Rupel emerges unscathed from the war. The frenzy after the 1944 Liberation gives the country a much-needed boost, supported economically a bit later by the Marshall Plan from 1948 onwards. Gerardus and Joanna's business of yore duly finds renewed energy and dedication to provide quality coffee to its customers, with renewed success as well. 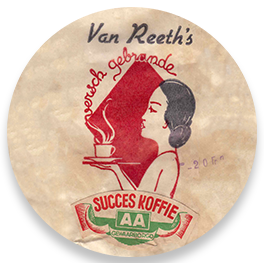 Like everyone in the country, the business makes a brand new start: on 23 October 1946, the company acquires its new name Van Reeth’s Succes Koffie and will from then on be represented by the girl and the smoking cup of coffee.Through the decades, she will of course change looks from time to time, but she will always stay the iconic symbol of Succes Koffie in every incarnation. Coffee consumption grows exponentially during the late 1940s and 1950s. Served more and more in cafes and restaurants, the drink represents an enormous new market to dabble into, prompting bigger and smaller innovations that fundamentally impact on the way people make and drink coffee to hit the market. 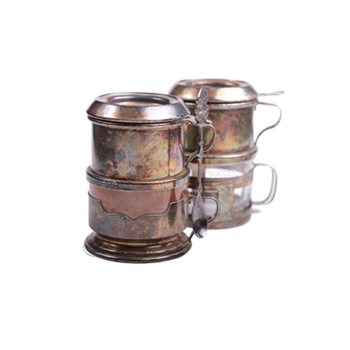 Succes Koffie is one of the first to introduce the coffee filter in the 1950s, even coming up with its own range of metal and porcelain filters, to be combined with its delicious ground coffee which comes in gold-coloured refillable tins. So now people can also enjoy the perfect cup of coffee full of aroma and flavour, even when they are at home! Another innovation that will have a major impact on the sector is the invention of decaffeinated coffee or ‘decaf’, which expands the target group for coffee and lets coffee fanatics enjoy their brew with no worries, even later in the day. 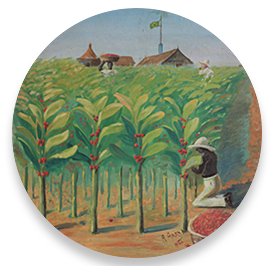 Through its 130-year long history, Succes Koffie has become a major player in the niche of quality coffee. 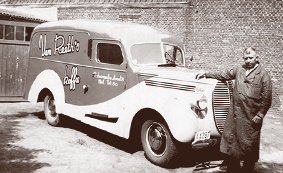 From a small business importing food products from the colonies, the company grew into specialist coffee roasters. Though we deeply care for tradition and the craftsmanship that is inextricably tied to the coffee roasting process, we have also grown our product knowledge and skill set and taken innovation on board at every turn. 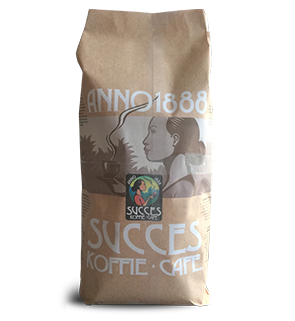 This is why Succes Koffie can offer its clients a no-nonsense quality guarantee. Primarily supplying the professional market segment, Succes Koffie offers quality blends, custom coffee machines and associated products to companies and catering businesses. We also provide technical support and home delivery, and we organise workshops round about the ins and outs of making and serving coffee. Every one of our Succes employees are passionate about their business and products, proudly and enthusiastically striving every day to give you the most intense coffee experience.